Indspilningen af Hej Frede er sket i samarbejde mellem DRs Forlag, Børneradioen & Sony Music. Project idea: Sten Wijkman Kjærsgaard, Danmarks Radio. Thanks to the artists - and to the following record labels: BMG/Genlyd, Polygram, Replay/Metronome, CMC and EMI-Medley. Mastered at Tocano Music A/S. © 1996 Sony Music Entertainment (Denmark) A/S. Issued in a standard jewel case with an 8-page folded booklet. 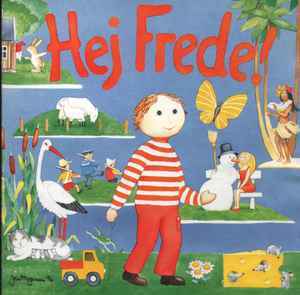 Fourth CD out of seven with Danish artists interpretations of children's songs. First CD from 1993: Åh Abe! Seventh CD from 1999: Tusindvis af Is!